So of course I grabbed my camera and went after it. After shooting some random “look there’s a skunk” shots, I got ahead of where it was going and waited for it. Well, it obligingly walked into the sun, started digging, and came up with a shrew! And then paused for a picture! I have never seen a skunk out in broad daylight before, and I certainly never saw one hunt down and catch a shrew. Most Striped Skunks have two white stripes running the length of their back. In his skunk the white stripes are so wide, they have almost merged. From the side it looks like a solid white back. Its scientific name Mephitis mephitis is taken from the Roman goddess Mefitis – the goddess of poisonous gasses. 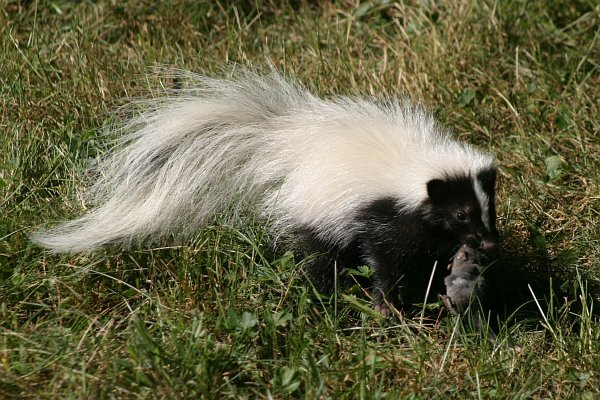 This, which is obvious to anyone who has had the pleasure of smelling it, refers to the odorous spray of the skunk.